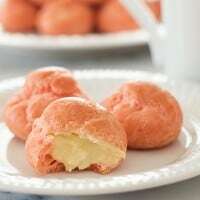 Pink Cream Puffs filled with a rich vanilla pastry cream. So cute and delicious you’ll want to keep them all to yourself. 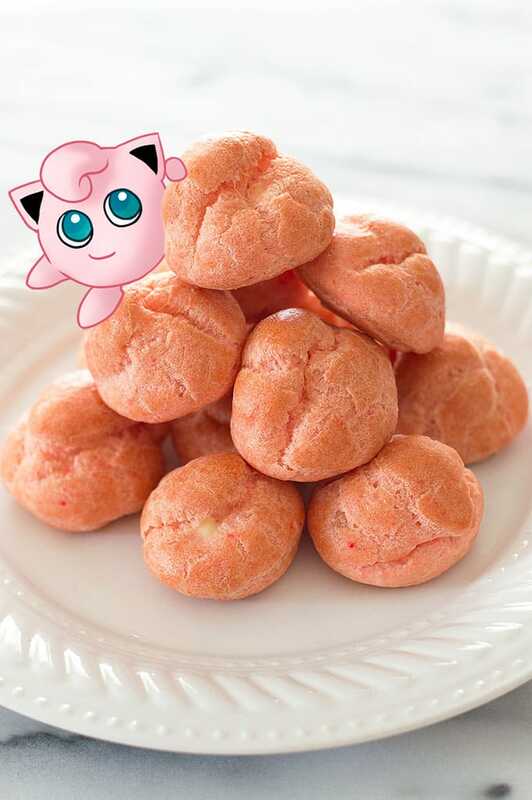 I have another fun and nerdy recipe for you today, Jigglypuff Pink Cream Puffs! A bunch of fellow bloggers are putting together a month of Pokemon-inspired recipes, and I definitely didn’t want to miss out on all the geeky fun. The recipe linkup is being hosted by The Gluttonous Geek. There are some really great ones in there, and you should absolutely head on over to check them all out. Have you been playing Pokemon Go? I have not let myself start because I was pretty obsessed with the Game Boy version as a kid, and it’s a slippery slope when it comes to me and Pokemon games, but it is sooooo tempting. Anyways, given my childhood obsession, when #PokeNOM month was announced, I knew I wanted to participate and Jigglypuffs and pink cream puffs immediately popped into my head. Have you ever made cream puffs from scratch? It’s easier than you might think, and SO satisfying. Your eggy, wet pâte à choux dough goes into the oven and these perfect fluffy puff balls come out half an hour later. I think it might be magic. The pastries bake up hollow, leaving plenty of space for fillings. Some people like a simple whipped cream filling in their cream puffs, but not today. Not in these cream puffs. 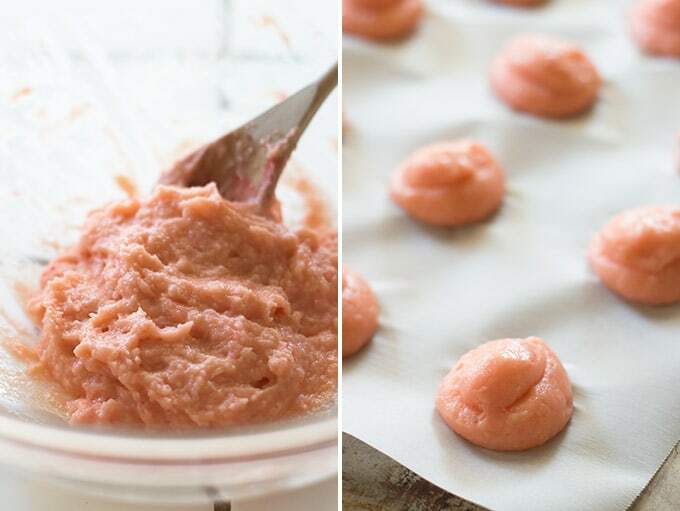 We are making a fantastically rich, gloriously creamy pastry cream for our pink cream puffs, so when you bite into them, you are met with a perfect, sinful center. And guess what, if you keep cream in your fridge for coffee, you probably have all of the ingredients to make these. 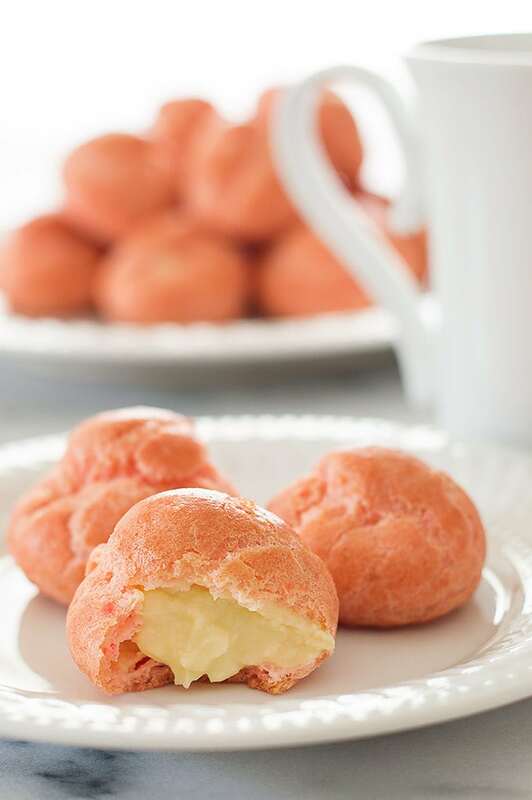 The great thing about these pink cream puffs is that they are made with simple kitchen staples. These fancy pastries do not require fancy ingredients! 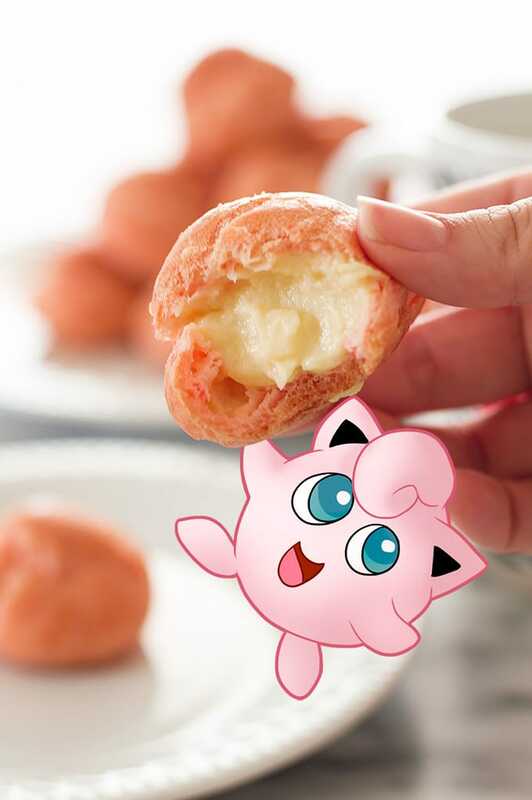 Okay, on to our Jigglypuffs pink cream puffs! You can find all of my nerdy recipes by clicking here. In a medium saucepan, heat milk and cream until just before simmering. Remove from heat and set aside. In a medium bowl, whisk together sugar, cornstarch, salt, and egg yolks. SLOWLY drizzle in hot cream mixture, whisking constantly so you don't scramble your eggs. Transfer egg mixture back to your saucepan and cook over medium heat, whisking constantly. Continue to cook until mixture thickens and begins to bubble, about 3 to 6 minutes. It's ready when it is the consistency of a thick pudding. Whisk vigorously until smooth, remove from heat, and stir in vanilla. Have your flour measured out and ready to go. In a medium saucepan, combine water, butter, sugar, and salt. Bring to a boil over medium high heat. As soon as the butter is melted and the mixture reaches a boil, stir in the flour with a wooden spoon. Stir until flour is incorporated and the mixture pulls away from the sides and forms a thin film over the bottom of the pan. Transfer dough to a large bowl and allow to cool for about 4 minutes, until no longer hot to the touch. Add 2 to 3 drops of red food coloring and your first egg. Use your wooden spoon to work the egg and coloring into the dough until completely mixed. It will seem slow going at first, but it will come together. Repeat with the second egg. Transfer mixture to a pastry bag fitted with a 5/8-inch tip. Pipe 14 1 1/2-inch mounds at least 1 inch apart. Once finished, use a little water on your fingertip to pat down any tips that are sticking up from piping so you have smooth rounds (otherwise the tips sticking up will burn). Bake for 25 minutes. Do not open the oven. At 25 minutes, check the puffs. They should be lightly browned. If not, cook for an additional 2 to 5 minutes. Remove from the oven and cool completely before filling. Use a chop stick or small, sharp knife to poke a small hole in the bottom of each cream puff. Transfer your cooled pastry cream to a piping bag fitted with a 1/8-inch round tip (if the cream has firmed up too much in the fridge, you can whisk it for about 30 seconds until it is smooth and the right consistency for piping. Fill each of the cream puffs with a generous amount of pastry cream. Serve and enjoy! Cream puffs are best on the first day, but can be stored covered in the refrigerator for up to 3 days.